Yellow school buses are an everyday fixture in our neighborhoods and communities, yet there’s a more complex story behind the design, safety and routes that transport students to and from school. School bus carriers operate the largest mass transportation fleet in the country, and the industry itself is projected to grow even more during the next five years. This includes the traditional school transportation industry as we’ve known it for decades, as well as school bus-related technology including fleet telematics and school bus tracking apps. 1. 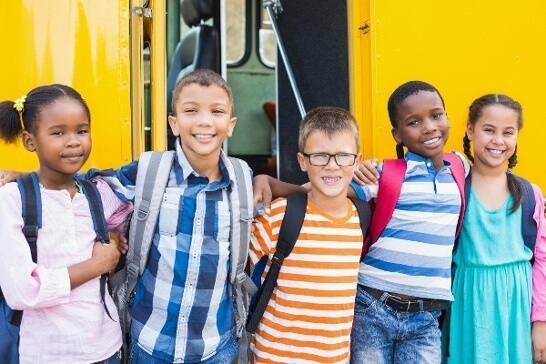 Not only do school bus operators make up the nation’s largest mass transportation fleet, but it is also 2.5 times the size of all other forms of mass transportation combined, including local transit buses, commercial airlines, and rail, according to the National School Transportation Association. In fact, more than 480,000 school buses transport students each day. 2. The country’s largest fleet also reduces the number of other vehicles on the road. The average school bus transports 54 student passengers, which replaces about 36 family vehicles, according to School Transportation News. This reduces traffic and accidents on the roads during busy morning and afternoon ride times. 3. Daily rides reduce costs for families, too. When parents put their children on the school bus rather than drive them to school, they save about 180 gallons of gas per year, $660 on extra gas, and 3,600 additional miles on their car, according to the American School Bus Council. They save money while feeling confident about their child's ride to and from school. 4. About half of America’s students take publicly-funded school buses to school, which equals an average of $915 per year per student who takes a ride. This has declined since district-funded transportation reached a peak at 61 percent in 1983, according to the U.S. Department of Education. In total, districts nationwide spend about $23 billion on student transportation annually. 5. In the end, the most important aspect of student transportation is moving students to and from school safely. The record stands true — of the average 40,000 deaths from traffic accidents that happen each year, only six happen in school buses. Several crash standards make this possible for school buses in particular, including rollover protection, bus body joint strength, fuel systems that prevent leaks and fires, compartmentalized bus seating, and pedestrian safety devices. Ultimately, buses must meet 33 standards for crash avoidance and crash survival in order to transport students safely.